At Eastport Market we strive to offer northern Michigan's finest local deli. Each day we serve-up a customized hot lunch menu featuring both traditional "staple" and ethnic foods, chili and our homemade soup-of-the-day. Our lunch menu changes daily, but often ranges from freshly-smoked ribs to a host of casseroles...from HUGE, fresh burgers to entrees prepared with traditional "south of the border" flair. And we're not talking frozen, pre-packaged heat & serve food, either. We're talking fresh ingredients from our own produce and meat departments - crafted into delicious meals taken from time-tested, home-cooked recipes. And they're made right in our own kitchen...just like at home. Not in the mood for a hot meal? Our deli offers fresh club and sub sandwiches made with our deli case Boar's Head brand meats including roast beef and ham combined with a variety of to-die-for cheeses. Croissant sandwiches are also available with generous portions of tuna or chicken salad. Combine any sandwich with one of our fresh-produce " to-go" salads and you have a meal in a snap! We'll Help Make Dinner Easy! Of course, our FAMOUS fried chicken is available for both lunch and dinner. Our steamy, fresh mac & cheese is also a staple in our hot case. Whole rotisserie chickens are cooked daily and ready at about 4 p.m. for a quick, healthy meal (ready times do vary). Our gigantic potato wedges are also a consistent hit (when we can keep them from being sold-out!). Of course, call-in pizza orders are accepted from the time we heat-up our ovens in the morning until an hour before the store closes. Our Weekend Supper Menu is Sure to Please Your Entire Family! Each Friday Eastport Market hosts our insanely-popular Fish Fry. We cook-up big portions of crispy, delicious Pollock fillets in our deep fryer - then marry them with creamy coleslaw, potato wedges and original Hawaiian brand sweet recipe rolls. During the summer months both Friday and Saturday meals include freshly-smoked Country Store Smokehouse spareribs, baby-back ribs, baked-beans slow-smoked to bubbly perfection, and sweet-potatoes unrivaled by even your mom's own recipe. Yep - that's right. Our smoked products are made right here in the front parking lot. WARNING: Entering Eastport Market while the smoker is revved-up and blowing steam can create uncontrollable appetites and salivations! Also available on Saturday evenings is prime rib by the slice. Our prime rib is carved from the finest cut of beef in our own meat room, then slow-roasted in our oven with a mouth-watering, custom blend of secret spices. Your juicy, tender beef is then custom cut to your exact specifications and served with au jus or horseradish sauce. Our Deli Cold Case is Always a Hit for "On-The-Go" Meals! 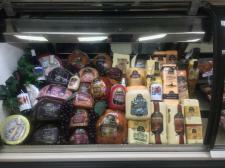 Our cold deli case features a superb variety of Boar's Head brand deli meats and cheeses. On any given day you'll also find cold salads which include pasta, seafood, fruits and vegetables. Also available are several varieties of chicken wings, chicken nuggets, twice-baked potatoes and desserts.